Special guest speaker Kate Bowker, Education Program Administrator, National Alliance on Mental Illness. 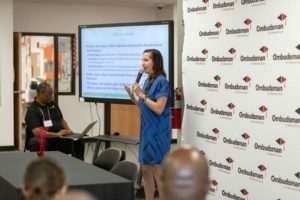 Ombudsman Chicago hosted the Second Annual Community Partner Summit on August 16 at our South Campus. The summit is an opportunity for Ombudsman and our community partners to come together for professional development, sharing information, and to discuss what services at-risk youth in Chicago need to feel supported and be successful in their educational efforts. We, along with our partners, are also committed to finding solutions to combat the violence that so many youths have experienced, in part by providing students with safe, supportive environments so they may grow and achieve their dreams. Presentation topics covered at the summit included Mental Health, Teen Parenting, Social Media Impact on Violence, Trauma, Restorative Justice, Social Emotional Learning, Post-Secondary Supports, Mentorship and Job Placement. 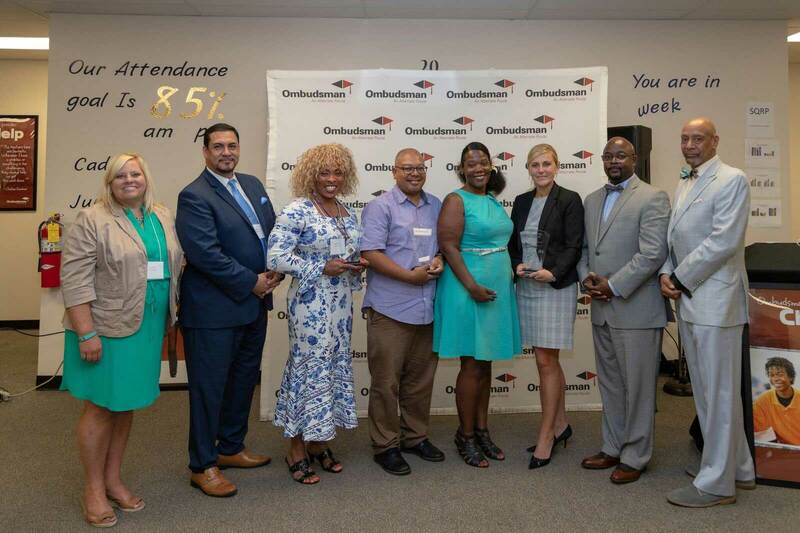 Pictured, Left to right: Sue Fila, Rudy Flores, Audry Blinstrup (Ombudsman South Principal), Michael Wilson (UCAN), Chez Smith (Gyrls in the Hood Foundation), Katarzyna Petek (East West University), Carlos Estes and Ralph Thompson. We also heard from an Ombudsman student and her parent, regarding her personal experience with trauma and the support she received from the Ombudsman West team. During the summit, Ombudsman representatives presented awards to several of our community partners for their service to students at our campus (see photo). We were so pleased with the turnout, as well as the commitment from the community to support the young adults we are all working to serve. Thanks to all contributing partners, honorees, and supporters for a wonderful event! Audry Blinstrup, Ombudsman South Principal, honored for her leadership. Michael Wilson, UCAN Supervisor, honored on behalf of the organization for the mental health services they provide. Chez Smith, Gyrls in the Hood Foundation, honored for her mentorship to our female students at the OES West Campus. Katarzyna Petek, East West University, honored on behalf of the organization for their support of our students in their college pursuits.